BREMEN, Germany -- Fulfilling its final duty as a trash hauler, the European Space Agency's second Automated Transfer Vehicle made a suicidal plunge into the Pacific Ocean on Tuesday with 2,600 pounds of garbage from the International Space Station. Meanwhile, German engineers are preparing Europe's third robotic cargo freighter for another resupply mission in early 2012. The 32-foot-long ship, named Johannes Kepler for the German astronomer and mathematician, undocked from the space station Monday and fired its engines twice Tuesday to lower its orbit and drop back into the atmosphere. The ATV was not equipped with a heat shield, so engineers expected the craft to tumble and burn up when it encountered the scorching temperatures of re-entry. Engineers at the ATV control center in Toulouse, France, lost radio contact with the spacecraft at 2041 GMT (4:41 p.m. EDT) as the ship descended at an altitude of about 50 miles, according to the European Space Agency. Debris from the ATV, including its main engines and docking adapter, should have impacted the remote Pacific Ocean around 2100 GMT (5 p.m. EDT), ESA officials said. Controllers expected the hardiest components to strike the ocean at about 43.05 degrees south latitude and 147.02 degrees west longitude. The remote strech of the Pacific Ocean is about 1,500 miles east of New Zealand and 3,700 miles west of Chile. A small hardened data recorder was inside the spacecraft to capture information on the environment the ATV experience during its fiery demise. Provided by the Aerospace Corp., the recorder was designed to transmit data back to engineers via an Iridium satellite before impacting the ocean. The ATV launched Feb. 16 and reached the space station Feb. 24. The Johannes Kepler mission delivered about 3,500 pounds of dry cargo in its pressurized cabin. Astronauts manually unloaded that equipment during the craft's stay. The complex is now circling the planet at an average altitude of 237 miles, higher than the space station has ever flown before. 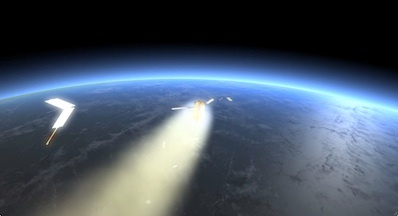 The reboosts were conceived to place the lab higher above the drag effects of Earth's atmosphere, increasing the station's fuel efficiency over the next decade. "The mission of ATV-2 has been very smooth and we have encountered during these four months only very minor issues that were quickly taken care of by our teams," said Nico Dettmann, head of ESA's ATV program. Attention now turns to the third ATV mission christened Edoardo Amaldi after an accomplished Italian physicist. "ATV has shown again its capabilities in servicing the station and we are looking forward to the next, Edoardo Amaldi, which will be shipped to Kourou in August for launch in early 2012." 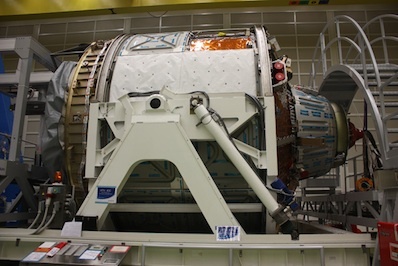 The Edoardo Amaldi spacecraft is undergoing final assembly and systems testing at an EADS Astrium facility in Bremen, Germany. "It will be shipped at the beginning of August," said Wolfgang Paetsch, head of the ATV program at EADS Astrium. "So in the next few weeks, we have quite a lot to do, but we're on track. We're very optimistic we will make it, and we are well-observed by a lot of people. And we think we can deliver in time and with good quality as we did for ATV 2." Unlike most satellites, the cargo freighters do not go through extensive shake and thermal testing to ensure they will survive the flight. Some individual components and systems go through such testing, but engineers are confident the ATV spacecraft is qualified to fly in space. Both ATV missions thus far have performed with almost no faults. The Edoardo Amaldi mission will carry more supplies than its predecessors in the ship's pressurized integrated cargo carrier module. It will also ferry oxygen, water and refueling propellant to the space station. Engineers conduct the systems testing at the German factory with the spacecraft in a "soft-mate" configuration, in which the ATV's cargo module is wired to the vehicle's propulsion and service module with cables and plumbing. That's enough to complete the necessary testing, and the ATV's central components won't be physically attached until they are at the launch site in Kourou, French Guiana. Once the testing is finished, workers will load the ATV on a ship to sail to the mission's South America launch site. Liftoff is scheduled for February. Pieces of the fourth and fifth ATV cargo freighters are already at the Astrium facility to begin assembly for launches in 2013 and 2014. "We're now at the peak of production," Paetsch said. "The center of gravity for ATV is now in Bremen, Germany." The ATV resupply flights are ESA's contribution to help pay for the agency's share of the space station operating costs.